When & How to Prune Rose of Sharon Bushes? The Rose of Sharon hibiscus, also called hardy hibiscus, is hardy in areas that have winter temperatures as low as 0 degrees F. If you live in Iowa or southern Illinois, or another region falling into UDSA climate zone 5 or higher, you can grow this plant as a shrub or a flowering hedge. 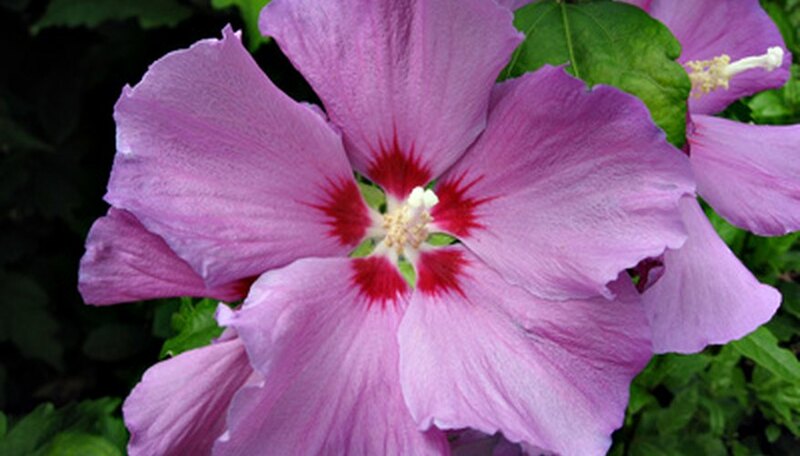 Rose of Sharon flowers range in color from white to pink, purple to red. If you don’t prune your plant or plants, blossoms will grow smaller but will be more numerous. If you do prune your hardy hibiscus, blossoms will be larger but not as plentiful. Prune your Rose of Sharon hibiscus in early spring after your plant has grown too large for the area where you planted it ,or if you want to form multiple plants into a tidy hedge. Use your garden clippers for small branches and loppers for larger branches. It’s important to sterilize your clippers or loppers before you begin pruning and after several cuts to prevent plant diseases. Wipe the blades with either water-free hand cleaner, hydrogen peroxide, isopropyl alcohol or bleach before you make your first cut, and then allow the medium to stay on the blades for at least 15 seconds before you begin. Repeat this treatment after several cuts and continue to sterilize your blades the entire time you are pruning your plant. Examine your plant to determine if it has any dead or diseased branches, and then cut these first, taking them back to the main trunk. After you have cut off all of these branches, continue pruning by cutting off about one third of the plant’s growth, but do not cut healthy branches back to the trunk—leave two or more nodes on each branch to encourage lateral growth. Water your Rose of Sharon deeply after you finish pruning it. Fertilize your plant with a half strength dilution of a balanced plant food once each week during its active growing season, from spring through late summer. You can train your hardy hibiscus to grow into the shape you desire by pruning about one-fourth inch above nodes that are facing the direction where you want growth to occur. Nodes are small bulging areas on the trunk or stem of a plant. Leaves or other branches emerge from nodes. Frost can damage your hibiscus if you prune it late in its growing season. To be on the safe side, prune it in spring. If any branches become damaged or diseased, it's all right to do spot pruning at any time, but avoid pruning upper branches because they protect the plant from frost.